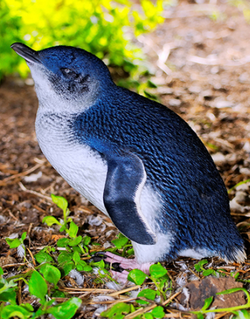 The smallest penguin in the world is the Little Blue Penguin. Little Blue Penguins only grow to be 13 inches tall. They live in New Zealand and Australia. Sometimes, they are called Fairy Penguins! Most penguins live where it is very cold, but Little Blue Penguins live were it is hot. This is why they do not have as many feathers as other types of penguins. The Little Blue Penguin is in the Spheniscidae family. Spheniscidaes are a group of aquatic birds that are flightless. There are 17 different species of penguins. Most penguins are black and white but the Little Blue Penguin is blue or gray.